The INPUTS worksheet is enabled when the planning mode is set to "Lite". The planning mode can be changed on the FINANCIAL PLAN > "Settings" section. 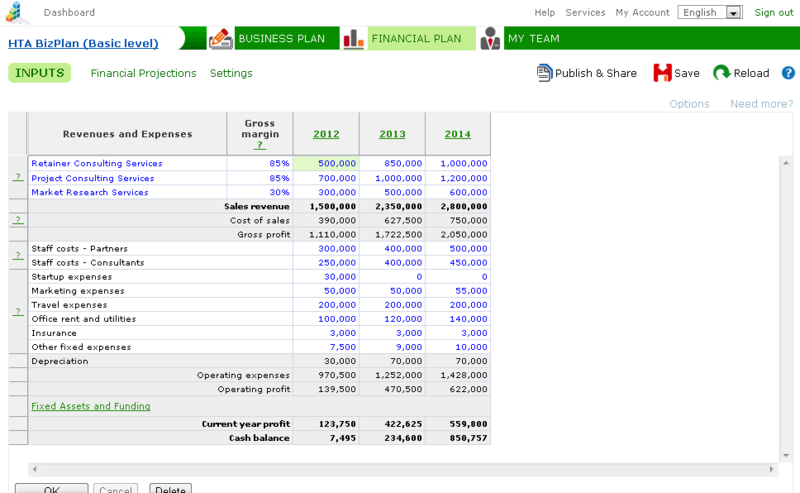 The INPUTS worksheet is intended for revenue, expenses, fixed assets, borrowing and paid-in capital planning. If you need more detailed software features for business financial planning, select the "Standard" planning mode (on the FINANCIAL PLAN > "Settings" section). In order to add rows or reduce their number, open the "Options" section and enter the desired number of rows for Sales revenue, Labour cost, Other operating expenses or Fixed assets. Click OK.
To clear an entire row of data, clear first the data from the extreme left cell and click OK.